When You Have Too Many Things on Your Plate…. Everyone’s life is hectic. I know very few people who are not stressed in some capacity. But, I think there are other people that put way too many things on their plates. Apparently, I’m one of them. I didn’t think I was one of those people. 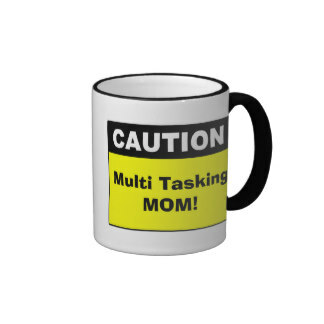 I thought everyone out there does 5,000 things before breakfast, works full-time, raises kids, has a garden, does hours of social media a day to promote their books, and tries to write novels – all at the same time. I thought no one sleeps and spends their evening hours stressing about all the little things that have to get done the next day. I know I’m not alone because at any given time I can find friends tweeting and facebooking at all hours of the night. We kind of giggle at the “Oh, you’re still up?” comments. 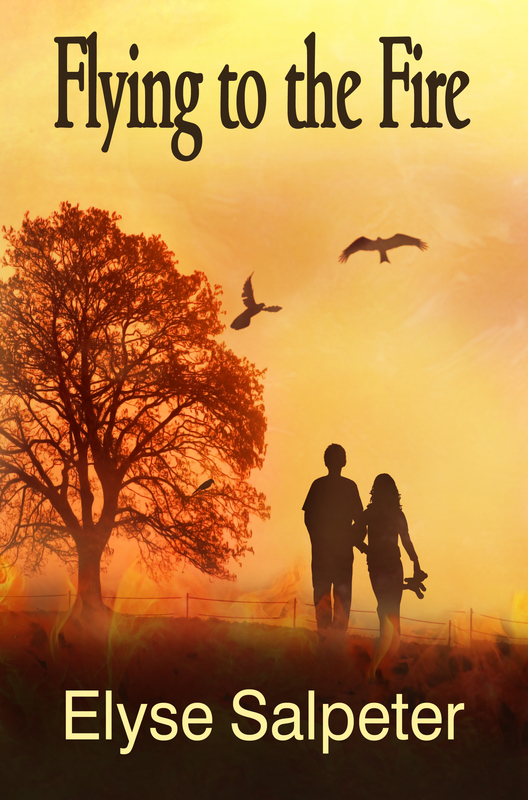 All while trying to edit one book, THE QUEST FOR THE EMPTY TOMB, book #2 in my Kelsey Porter series, and put out and publish my finished Book #2 in my YA Deaf thriller series, FLYING TO THE FIRE. I just have to get through the final proofs on that, get it formatted and it can be submitted to the universe. What Materials Should You Have for a Book Signing? I’ve been to book signings where some authors seemed to bring every single piece of collateral material they own and I’ve been to others where the author had an empty table, no books and a single sign up sheet for their newsletter (I don’t recommend this second option at all). I’ve compiled a list of what I think makes a really great table. These are just my thoughts and I would love to hear from authors any other ideas that you have that have been successful for you. I’m all ears. Now, it took me awhile to get all this material because, let’s face it, it’s pricey to get it all at once. But, build your material base slowly and you’ll find you will soon have a nice amount of collateral for your table. First, get a nice tablecloth. I have two. One small round one for card tables and one larger, rectangular one. I chose a nice red, with a linen feel, that I got pretty cheaply at Target. I think they cost me $16 each. Make sure you have copies of your books. In my early days I made the mistake of thinking I’d sell 50 books at my very first little library chat (stop laughing)… I’m still getting through that inventory. I suggest bringing no more than 20 books at a time. If I have an event with more than one novel being presented, I’ll bring that number down to ten or fifteen each. Business Cards: You can get them cheaply at Vista Print. I made these myself and they cost me hardly anything. I totally manipulated their template and put on it exactly what I wanted. 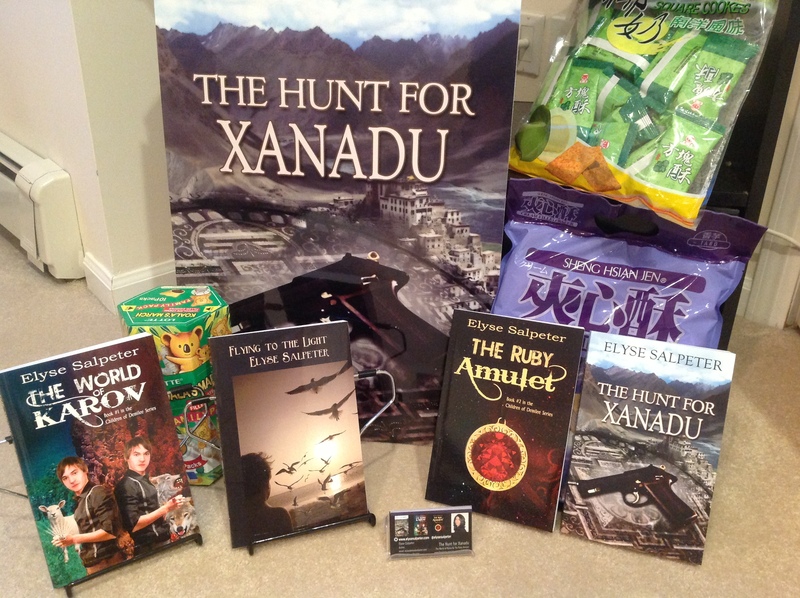 Poster: I got a nice poster for my novel THE HUNT FOR XANADU for under $50 at Staples. It looks great and I plan to get additional posters for my FLYING TO THE LIGHT series when I can. I’d recommend getting an easel or even an old music stand to showcase it. Postcards. This is the newest thing I’ve purchased and I LOVE THEM. Why? 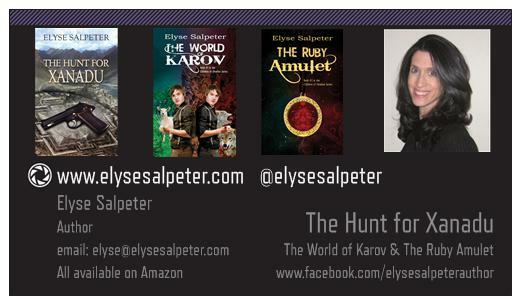 This way if I don’t bring the books, I have a postcard to give out with a blurb written up about the novels. 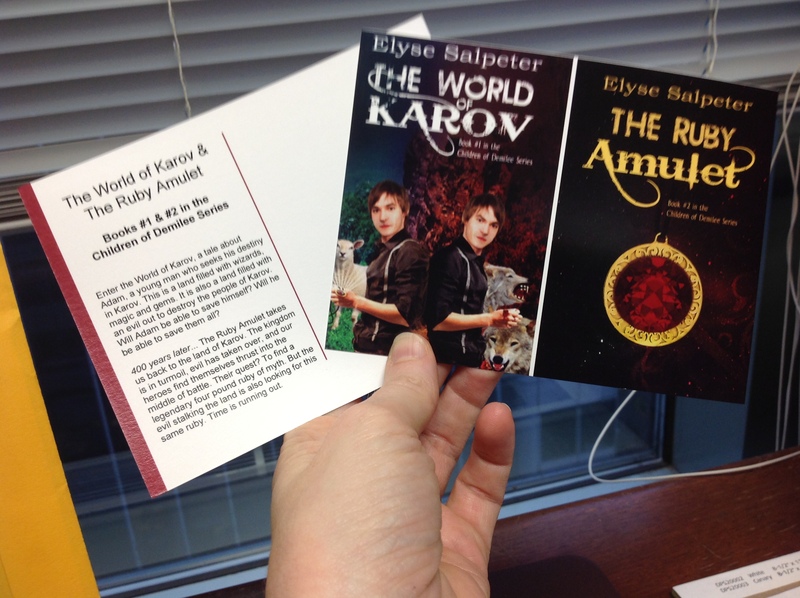 One half of the postcard is empty so I can write a note to them and it offers a nice recap of the novel so if someone wants to later download it to Kindle, they can. I got these at Staples too. I purchased them in bulk and got them for about $0.80 or so each. I love the idea of putting two books on at once for a series and plan to do them for my next YA series coming out. Candy. Seriously, who doesn’t like candy? For one event where I was showcasing my buddhist thriller I tried to keep “to the theme” and purchased individually wrapped asian cookies. I couldn’t give them away, but the chocolates I brought as a back-up were a hit. That’s now my candy of choice. I splurge and get Dove Chocolates and put them in a little glass bowl. If no one comes to your event, at least you have something yummy to snack on. Other various things for your table. Email sign-up sheet and some photocopies of your book’s reviews. If people coming to your table seem to be waffling about the book, you can simply hand them a sheet of paper that has the reviews downloaded right from amazon and they can take it with them to read. I thought of having my trailer run on a loop on an IPAD, but I haven’t done that yet. I have seen other authors do it, but it requires people to stand there and watch a video versus talk to you. I still like the idea and it seems to be a nice thing to run in the background for your table. If anyone has anything else that works, please tell me. I would love to hear. I thought every author wanted to do a book signing, but I’ve found this is not the case. Actually, it seems to be a contentious subject, with pros and cons of why authors do, or don’t, do live events. I have to vehemently disagree here. Yes, you can reach more people with online efforts, but a book signing is NOT for sales. It’s for exposure, for respectability, and for practice. While authors live in their minds and type stories into their computers, they need to be able to verbally discuss their novels. You have to be able to talk to people to pitch it to them, to explain it, to paint a picture as to why they should buy your book. What if you’re one day in a room with a top editor and you’ve never actually had the chance to publicly discuss your book? A signing allows you the opportunity to engage active readers in a whole different capacity. Sometimes you get a chance to do a reading, like we did, and if you pick the right segment, you can influence potential readers on a whole new level. This practice is a wonderful learning experience and one you should consider doing a few times a year. I also believe book signings offer authors a “perception of success.” Meaning, you take photos of you and your readers and you post them to social media. You do the reading and tape it and post it to your author or Pinterest page. You get press to cover you. All of these together will show people in the industry that you are capable of successfully being in front of an audience. That you’re “a player, professional, and capable.” If an agent, publisher or producer ever wants to contact you, they will see all this “success” and exposure you’ve built up. Maybe authors are afraid if they do a signing no one will come? That could happen. I did a signing with 18 other authors at a four hour Book Fair a few weeks ago and it would be safe to say 15 of us didn’t have any sales. ZERO. I had candy out and the people visiting my table were mostly other authors during this very long event who came over to snack on my Dove Chocolates (yes, get the good stuff). So, even though I had no sales, what did I get out of it? 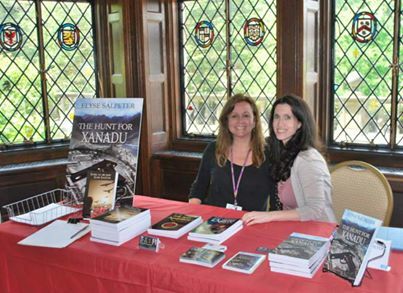 The experience of putting my table together, some great photos, a few sign ups for my newsletter and I got to pitch my book and network with other authors. I once had an author talk at a library and only three teenagers came. I ended up moving all the chairs into a circle and the four of us, with the coordinator, sat down and we had a real heart-to-heart about publishing. It was casual and intimate and I’ll tell you something – even though I didn’t sell any books, I got a lot out of it. I got the experience to chat about my novels, educate the kids on publishing and possibly influence a young mind. I leave you with this: GET OUT IN THE FIELD. Do a signing, do a library chat. Get that poster made, get in front of people. Talk. Don’t just write. Tell readers about your wonderful ideas. I promise you that you will get more out of this versus an online ad that will give you just a few extra book sales. I’ve been told by a well known author in the industry that this is my “hazing” time. Well, folks, consider me duly hazed. I am so excited to participate at a Book Signing at the illustrious Dolphin Bookshop on June 7th from 2-4 in Port Washington, NY. 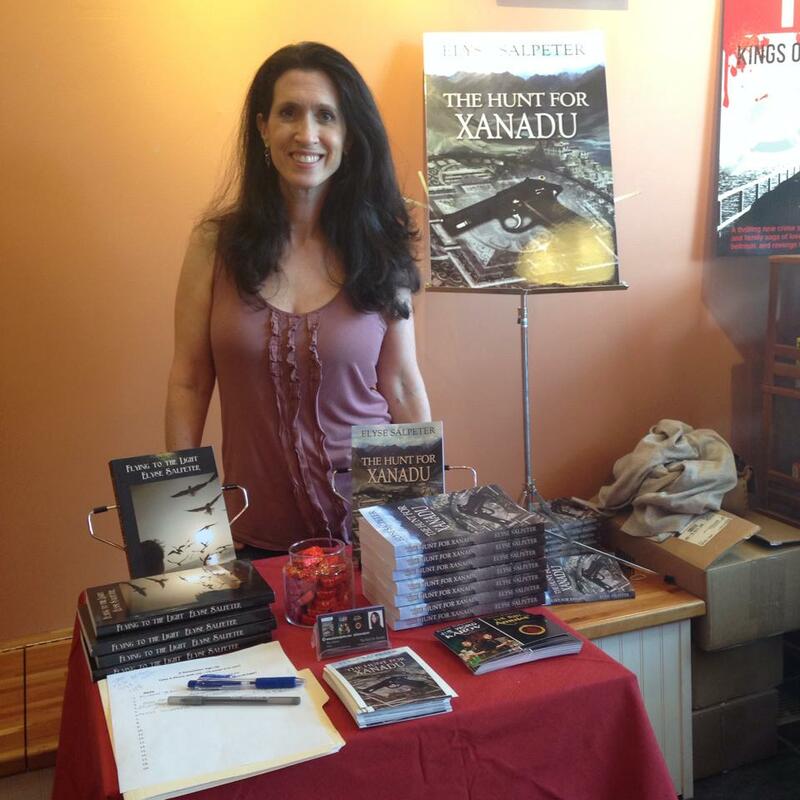 I’m part of a multi-authored event where I will be promoting my adult thriller, THE HUNT FOR XANADU. I’ve been asked to prepare a 90 second reading. Now, I’ve been to author readings before. I won’t lie. I don’t usually like them. In fact, at two library talks I did, the coordinators suggested that I don’t do a reading because they felt that they weren’t interesting enough for attendees. Hmmm. You see, there are some books, when read aloud, just don’t sound good – especially the ones riddled with sentences that end with “he said, she said, they said, Karen said, said Mark…” you get the picture. I was at one recently, and there was so much of it, that it completely broke up the entire flow. Hidden in the security camera’s blind spot, she sucked in her gut, closed her eyes and listened intently. “Come on, already,” she thought, drumming her fingertips rapidly against the brick wall. She heard the dogs panting now. This sound had replaced the earlier frenzy of them tearing into the drugged raw hamburger she had thrown over the fence just twenty minutes before. She’d crushed thirty-six Acepromozin tablets into the ground meat, reckoning it would enough to knock out the four guard dogs, if not kill them outright. She glanced at her watch and waited. This is taking so long. Five more minutes passed, with nothing sounding except the soft, rotating click of the camera. Abruptly, she yanked down the protective goggles resting on her head and placed them over her eyes. The clicking now echoed loudly, indicating the camera was once more faced in her direction. Brazenly she stood, aimed her laser gun and pointed it directly into the lens. The high tech, silicon-based CCD camera had an impressive wavelength sensitivity. The laser’s high-powered emitter instantly saturated the pixels of the camera’s CCD sensor and burned the chip out instantly. Ricardo Perez thought he protected himself with the best of everything. He’d under-estimated meeting an assassin so invested in seeing him dead. Hooking the laser into her belt loop, she flung her knapsack over her shoulders and scaled the wall in a practiced leap. She balanced delicately on the edge to prevent being punctured by the barbed wire and slipped on a pair of leather gloves, grabbed the wire cutters hanging from her backpack and snipped her way through. In less than twenty seconds, she was inside the backyard of the compound. Three of the dogs lay unconscious in the grass nearby, but their twitching feet told her they were still alive. Where is the other one? A deep, menacing growl came from behind her and she whirled to face the remaining Doberman. She had just enough time to register the bits of bloody hamburger still clinging to its snout before it lunged. Her instincts kicked in and she did the only thing she could remember. She punched the animal savagely in its throat like she’d been taught, and it fell to the ground, dead. Breathing hard, she turned back to the house where Ricardo had hoped to escape from her. Her body shook and she took a deep breath, trying to keep her anger in check. This man couldn’t expect to destroy her family and get away with it. He was going to pay. I might add on (since it’s all of 45-60 seconds), or not. But here’s the kicker… I DON’T HAVE TO READ EVERY SINGLE WORD! That’s right. In the above reading, I might remove the last sentence in the first paragraph entirely and simply move on… this is your reading, your time to shine in the spotlight – heck, you can make everything up if you’d like – it’s like doing a presentation for work. Your audience doesn’t know what you’ve prepared or what you’re presenting, so there’s no reason to ever be worried about making a mistake. Even if you stumble over your words. Just own it and move on. Remember, the attendees don’t want an embarrassing situation either – they want you to do well – that’s why they are AT your signing. Want to come get a signed copy of the book? Here are the details!